Writers are controlled with Writer parameters. Because parameters refer to specific components and characteristics of the related format, Writers of different formats have a different set of control parameters. 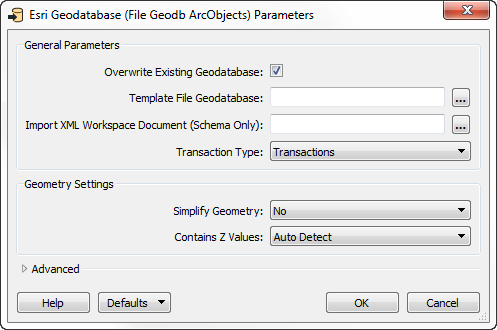 Writer parameters can be located - and set - in one of two locations. This means the screenshots below are slightly different too. Secondly, after the workspace is generated/Writer is added, parameters are shown and set in the Navigator Window. For ease-of-use, basic parameters are listed first, followed by advanced. To edit a parameter, double-click it. 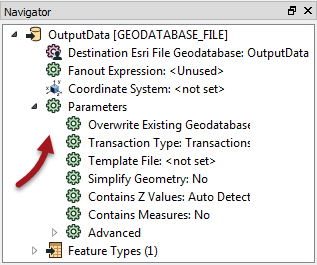 A dialog opens up where the parameter’s value may be set.